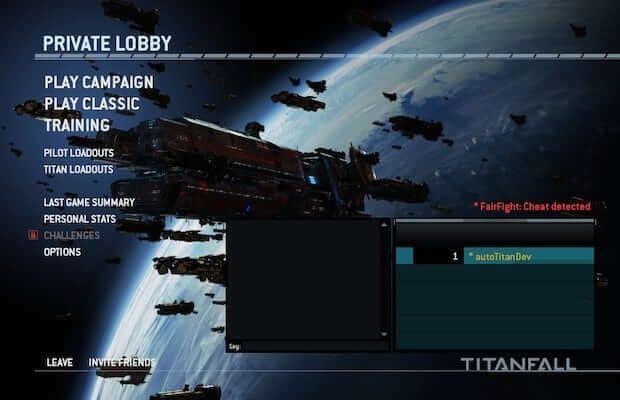 Respawn has posted a new update regarding the anti cheat system used in Titanfall. The big change that was announced today is that if you’re caught cheating, you can still play the game, but only with other cheaters. As seen in the image above, if you see the “Fair Cheat” in your lobby screen, that means you have been banned. Q.) If I’m banned, what happens if I make a party with my non-cheater friends? A.) When anyone in your party is banned, then everyone in your party will be treated as banned for that play session. If you are a non-cheater and you invite a cheater friend into a party, you will be stuck playing against cheaters. If you stop inviting your cheater friend, you will once again get to play with the non-cheater population. You do not get permanently tainted just by playing with a cheater – you are only banned for cheating if you are actually cheating. Q.) How do I get unbanned? A.) You can contact [email protected] if you think you’ve been banned unfairly.